← All Natural Birth Control: SymptoThermal Fertility Awareness Natural Family Planning Review – Does it Work? Baking with Reusable Silicone Muffin Cups Review – Does It Work? Silicone baking mats and trays have been gaining in popularity in recent years. They offer many benefits such as being lighter weight, non breakable, and easily storable. They also come in fun colors which brighten up the kitchen. While the final verdict is not yet in, the silicone used in production is food grade and is considered generally safe for your family. (Articles on safety here, here, here and here). But is using the more expensive silicone muffin cups worth it? Many, many more uses than just baking muffins are possible! Last Christmas, a dear friend gave me a gift card to a specialty kitchen store. The first thing I got was a butter crock, which I had been wanting for a long time. My second choice was a little harder, but I settled on silicone baking cups for muffins. I was excited to try them as they were free (for me) and would replace all those little paper wrappers I’d been buying for so long. The baking cups arrived and I put them to work immediately after washing. I mixed up my family’s favorite banana chocolate chip walnut bread (with whole wheat flour substitution, and maple syrup to sweeten), had the three year old put the baking cups into the muffin tin, and filled them up exactly the same way that I would the paper wrappers. The silicone is safe in the oven up to 425 degrees F so I wasn’t worried about baking at all. The muffins turned out great and I didn’t notice any good or bad differences in the quality of the baking vs paper. 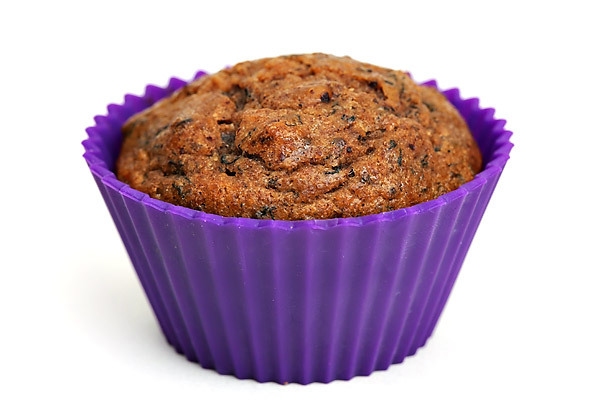 Overall, I recommend reusable silicone muffin cups. They work well, but not better than disposable muffin cups. They are reusable, and fun to look at. My kids enjoy picking out what “color” muffin they will have. I feel good being able to reuse them. But I’m not sure I would have sprung for them without the gift card. They are tricky to clean – I find a long soak, and attention with a scrubby sponge can do the job, but not quickly. Go get some if you feel excited about this idea, but if you don’t you will probably survive! I sometimes make egg muffins (eggs, meat and cheese scrambled together) and bake them in these cups. The sticking problem is still there to some extent. I also use them to quarantine wet foods in box lunches. That works really well in containers that are about the same height as the cups. They can also be tucked into odd little spaces in a box because they are pliable. They work well for freezing individual portions of thing in the freezer. Once frozen, whatever it is can be easily popped out and all of them put into a storage bag or wrapped up to take up less space. They are good popsicle and jello molds. I can’t wait to start using them in all these new ways! Do you use silicone bakeware? What has your experience been? Do you have any other ideas on how to use these little baking cups? This entry was posted in In the Kitchen, Real Food and tagged better for the earth, cooking, kitchen, reusable. Bookmark the permalink. 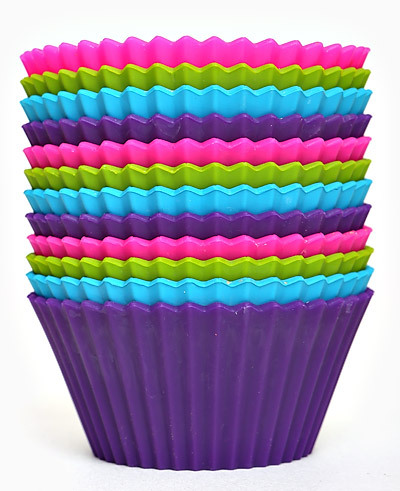 38 Responses to Baking with Reusable Silicone Muffin Cups Review – Does It Work? I’ve had a set of these for several years and have found them to be more useful in non-baking applications. I tried them several times with muffins and found them frustrating. Since changing our diet I don’t bake anything grainy or even substitute grainy so I have found several different ways to use them. I’m sure I haven’t come close to plumbing the depths of usefulness for these and other commenters will have lots of ideas. Andrea!! This is amazing! I am upping my rating and recommendation to 4 out of 5. I never thought of all these great uses for the little cups. THANKS! I’m loving the new ideas too! I have a bunch of these that I received as gifts and I have never used them. I think I might give them a try next time I am baking. I was thinking they might be perfect to make my peanut butter cups in! Thanks for the review. It would certainly sway me to buy some if my children were all young again. They look like they would be fun to use! Popsicle molds! What an excellent idea! I didn’t think they were very expensive, I think I got mine at Bed Bath and Beyond. I’ve always thought the paper ones were way too expensive, lol. Was just at Wal-Mart. In the cake decorating aisle there are bags of six cups for $2 a bag. They look to be thinner than mine, likely not as sturdy. Watch out for the cheap ones. My reading on the saftey of silicone bakeware (links above) said that some of the cheaper versions have fillers in them that make them more likely to break down, and more likely to release foul odors and other junk into your food. You can test to see if they have fillers by twisting, or bending. If the rubber turns white at the stress point – buyer beware! I have been tempted to get some of these… but since it’s just me and my hubby, I don’t bake that many muffins or cupcakes. I do love the colors. I like these baking cups, but there’s one issue I have with them. They must be BONE dry before you stack them after cleaning them because if not mold grows! They stack together so tightly. I think I’m going to have to dry them off in my dehydrator first! I got mine using a 40% off coupon at Michael’s Craft Store. I use them primarily in our Easy Lunch boxes to corral the different types of food. So they make a large compartment into several smaller ones. I’d put things like raisins, goldfish crackers or cheese cubes in them. The favorite of the kids was when I made jello or pudding in them. Most of the time they made it home, you do have to brief the kids that these are not to be thrown away. I only have 10 of my dozen left, but now we know. I haven’t had the mold problem that Janknitz had, I just hand wash them and put them in the dish drainer to air dry. It might be that I live in a desert with dry air though that makes the difference. Thanks for all the explanations. I have a couple of silicone baking mats and loaf pans and I’ve been wondering if they were safe. I appreciate the info. I love your thoughtful analysis on this! I started out with a silicone oven mit, then square baking pan, then silicone ice cube trays. I have to say the fact that baked goods pop out so easily makes it worth it to me. It’s also harder for me to burn things in them for some reason. I haven’t tried the cupcake/muffin molds, but I love our idea about using them to freeze things. My silicone icecube tray usually holds my homemade pesto sauces that I can pop out and throw into a sauces pan after boiling some pasta when I’m super hungry and in a pinch. Keep these great reviews coming! Re: food not burning, it’s been my experience that some foods can actually take longer to cook in silicone as well. It may just depend on the oven, though. There’s also the issue that some silicone baking cups stand up better than others. My mother once got a silicon muffin tray, and it had to be inside a regular metal one or it would collapse on itself. She still uses the cookie sheets, though, because it’s nigh-impossible to burn cookies on one. I use them as a mold for sunscreen bars, deodorant bars, and all sorts of home made body care stuff. It adds some nice flare to otherwise boring looking things. My only watchout on the dollar store ones, is that you may not want to bake with them. My research says that the cheap ones can have fillers that release odors as they are heated. I’ve noticed that the muffins demold really easily, especially when chilled first. Perhaps you could chillin the fridge, remove the cups, and then freeze? These cups have become a big part of my kitchen arsenal. I use them to make cute lunches for my son as they come in all kinds of shapes: butterflies, flowers etc. I make pudding and jello and use them in our bento lunch boxes. I think I have gotten my money worth. I have also picked them up from Marshall’s, Home Goods and the like where they are not super expensive. You’ve been in test kitchens April? I want to hear more! A few things I’ve learned with the silicone molds is that with the first use they do need to be greased (I use coconut oil) or the baked goods will stick especially if you tend to cut back on using oil or butter in your baked goods. Also don’t let them near smelly foods they will take on the smell. Yes – I’ve noticed they get less sticky with use as well. Thanks Brettney! I have some and have no trouble at all cleaning them if I do it this way: I don’t soak them, so the crumbs stuck in the crevices can get a little harder, and then turn them inside out. This ways most of the crumbs pop out for themselves, and the ones that don’t are easily removed scratching lightly with the fingers (or a scrub sponge if they are particularly stubborn, but I never had that happen yet). Then wash normally, and voilà! Clean cups! Thanks! Sounds like a great idea! I have always been too cheap to use muffin papers. I just put the batter directly into a well-greased muffin tin. But when I asked for new muffin tins for my birthday a few years ago, my brother got me the silicone type. They are not like yours; they are pans, each with cups for 6 muffins, and the cups are smooth, not ridged. The only thing I don’t like about them is the floppiness; I usually set them on a cookie sheet so I can put them into and out of the oven more easily without spilling. But they are non-stick and easier to clean than my old metal muffin tins. They also make great jell-o or candy molds, since you can turn them inside-out to pop out the food when it’s done. Another interesting idea is using mini-cups for dessert portion control. It’s easier to stick to a diet if you have a tiny bite-sized chocolate cake waiting for you! They also make great mini-desserts for kids’ boxed lunches if you’re already using a Tupperware or other plastic container. did putting the silicone in the muffin tins (to give them stability) cause the non browning? were your muffins nice and brown all over? I bought mine on amazon. They were called Slick Cups and they work great! Very durable and I received a free spatula and a recipe with 12 cups. I only paid half price $5 with a Coupon code from their Facebook page. Offer ended but I noticed they posted on another one Pinterest a few days later. Oh btw they are very easy to clean. Just be sure to spray them with your desired cooking spray. You can also put them in the dish washer. Major disappointment here. These molds (I’ve bought one with cups connected to each other) stink horribly when in the oven, and I even cooked on a lower temperature than they were supposed to be safely exposed to. It’s supposed to be safe up to at LEAST 392F, the manufacturers usually claim far more, but just to be sure I baked my muffins at 338F (170C). I also washed before use. I threw the first muffins away, because – although they baked slowly but decently – they smelled nasty. I thought, maybe it is just the first use, then I washed again and repeated the process, I threw the next batch as well. I surely wont be using the mold to bake again, although it was easy to clean the cons make it impossible to cook in it, and I doubt I’ll be using it at cool temperatures either. This material just smells so horribly. This is far from “inert”, as it’s being advertised. I am strongly convinced that toxic substances and fumes WILL be leached from these. It made me sick, and I couldn’t eat the food cooked in it for the reason of nasty ammonia-like smell that got into it. Buyer beware. The cheapest I have found are at Walmart Stores @ $7.50. I absolutely can’t stand these things, wood (paper) is the most renewable resource in the world, on the other hand, clean water is a precious commodity. I usually have to wash them before and after each use since they seem to grow mould between uses no matter what I try. In addition the time required to clean them even just once is absolutely ridiculous. Save the planet, save yourself, don’t buy these overpriced, overhyped pieces of literal dirt. Kill Mold and Mildew with Tea Tree Oil Review – Does it Work? Aluminum Foil Dryer Balls Review – Do they Work? Natural Crystal Stone Deodorant Review – Does it Work? Using Vinegar as Fabric Softener Review – Does it Work? Using Vodka to Deodorize Dry Clean Only Clothing Review – Does it Work? Eating Marshmallows To Soothe a Sore Throat Review – Does it Work? Washing Laundry With Soap Nuts Review – Do They Work? Share GIR with your readers!